The War Memorial Opera House is an opera house in San Francisco, California, located on the western side of Van Ness Avenue across from the west side/rear facade of the San Francisco City Hall. 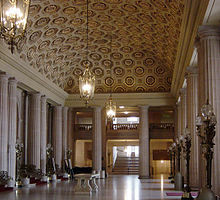 It is part of the San Francisco War Memorial and Performing Arts Center. It has been the home of the San Francisco Opera since opening night in 1932. It was the historic groundbreaking site for the organizing assembly San Francisco Conference for the new United Nations Organization (UNO or U.N.) in April 1945, inspired by recently deceased 32nd President Franklin D. Roosevelt, following World War II, to replace the previous faltering League of Nations, from the Versailles Treaty and Paris Peace Conference, ending World War I in 1919, inspired by 28th President Woodrow Wilson. In 1927, $4 million in municipal bonds were issued to finance the design and construction of the first municipally owned opera house in the United States. The architects of the building complex were Arthur Brown Jr., who had also designed the adjacent San Francisco City Hall between 1912 and 1916, and G. Albert Lansburgh, a theater designer responsible for San Francisco's Orpheum and the Shrine Auditorium in Los Angeles. Completed in 1932, it is one of the last Beaux-Arts / Classical Revival style structures erected in the United States and employs the classic Roman Doric order in a reserved and sober form appropriate to its function commemorating all those who served in World War I (1914/17–1918). A colonnade of paired columns screens colossal arch-headed windows above a severe rusticated basement, a scheme that owes something to Claude Perrault's severe East front of the Louvre. The interior contains a grand entrance hall with a high barrel vaulted and coffered ceiling parallel to the street, with overlooks from staircase landings at each end. The theater space is dominated by a massive aluminum and glass panel chandelier under a blue vault, and the proscenium arch is decorated with gilded figurative sculpture. The theater has 3,146 seats plus standing room for 200 behind the orchestra and balcony sections. This is smaller than the Metropolitan Opera (3,800 seats) and the Chicago Lyric Opera (3,500 seats), but it follows the trend of larger capacity in American opera houses than the main European opera houses of the 19th century (Paris Opera Garnier 2,200, Royal Opera House London 2,268, Vienna State Opera 2,280, and La Scala 2,800). The San Francisco Symphony performed most of its concerts in the house, from 1932 to 1980. RCA Victor recorded the orchestra here, under the direction of Pierre Monteux, from 1941 to 1952 and in a special stereophonic session in January 1960. The orchestra also made a few recordings for RCA with Enrique Jorda in 1957 and 1958. In later years, the orchestra used a special acoustical shell that was placed around the musicians, greatly enhancing acoustics for concerts. The orchestra's final concert in the house was an all-Beethoven concert, conducted by Leonard Slatkin, in June 1980. After the Japanese attack and bombing of Pearl Harbor, Hawaii, marking the American entry into World War II in December 1941, the households was regularly blacked out and performances were monitored by air raid wardens. 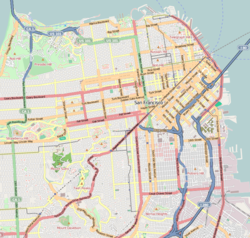 In spring of 1945, the United Nations had its San Francisco Conference (UN Conference on International Organization) first organizing assembly there. The UN Charter was later drafted and signed in the Herbst Theatre next door. Six years later in 1951, the Treaty of San Francisco, declaring peace with Japan was drafted and signed here and in the Herbst Theatre. During the years of Kurt Herbert Adler's general directorship, the inadequacies of the house became apparent as the season was expanded. In particular, there was a lack of office space and rehearsal space. In 1974, The Pointer Sisters were the first pop act to perform at the theatre. In 1979 the backstage area was extended, followed in 1981 by the opening of a new wing built onto the house on the Franklin Street side. This gave spaces for sets, coaches, and dancers as well as more administrative space. At the same time, the nearby Zellerbach Rehearsal Hall, with a stage the same size as that of the Opera House, was opened as part of the complex which included the Louise M. Davies Symphony Hall. Replacement of chambers for a never-installed organ with modern restrooms, sorely needed since the original construction. The organ is not needed with the completion of the nearby Davies Symphony Hall. An underground extension below the neighboring plaza to accommodate additional dressing rooms and backstage facilities. ^ Gamson, Joshua. The Fabulous Sylvester: The Legend, the Music, the Seventies in San Francisco. Reprint edition. New York: Picador, 2006. Wikimedia Commons has media related to War Memorial Opera House.